The wrist brace may be keeping me away from the sewing machine, but I'm still able to peck at the keyboard thank goodness, so I've used this time to implement a little blog makeover. If you are reading this post in a blog reader, click through and have a looksie. I've used the colors plum and chartreuse for the header and links, and I just realized those are the same colors I chose for my wedding a couple of years ago. Which then led me to think about my wedding invitations - I made them myself and it involved the use of my sewing machine. Yes, I even stitched my wedding invitations! I should share pictures of those here, and this week would be a great time to do it since my current projects are stalled for the time being. Speaking of makeovers, my nails are all set for a fabulous new color. I recently discovered the world of nail polish blogs(! ), and I won a giveaway from Kelly of Vampy Varnish. 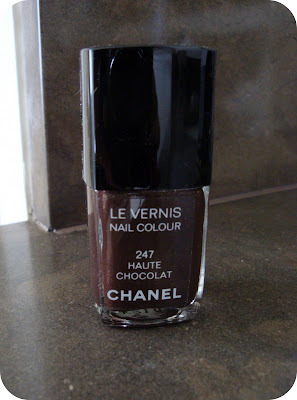 It's my very first Chanel polish, Haute Chocolat, for Holiday 2008. I'd love it for the name alone, but the color is gorgeous too. Thanks, Kelly! I want to know more about nail polish blogs! I love nail polish. I like the new header and the colors. I hope you post your invitation! I like the new header...the colors are very cheery!!! I love the colors plum and chartreuse. I just bought a purply plum velvet blazer ( I am not brave enough to sew velvet yet) and I am about to make a chartreuse cami to go with it. Also, I love nail polish. I just polished my toenails OPI Siberian Nights and I do my own acrylic nails. I like, I like!! Discovered Nancy's Sewing Basket today....it's AWESOME! How fascinating that there are polish blogs! I love the new header! Please please please (I'm begging here) share your wedding invitations and any other diy things you did for your wedding - I would love the inspiration for my own. I love the new header colors. As a red-head (graying) I use dark brown a lot. I have an entire wardrobe of fabric collected that includes the colors brown, chartruse and lime greens, dark purples, turquoise and cream. Your header has inspired me to finish my denim trousers and my husbands smoking jacket so that I can start that wardrobe. Oooh looks like we share another hobby :-) My fav blog is http://www.alllacqueredup.com/ I love Chanel and CD polish...other than the colors I love the Chic bottles lol. Lindsay, I made the header at Picnik.com, I love that site! You are most welcome, thanks for the mention!